Home > News > Would Gandhi Use Social Media? Would Gandhi Use Social Media? 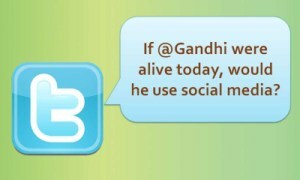 If Gandhi were alive today, would he use social media? He was never anti-technology, or even anti-changing with the times. Quite the opposite, actually. If Internet technologies and social networks were around, he would certainly have embraced them -- but with a conscious mindfulness of their strengths and weaknesses. Any social-change hero succeeds in doing three fundamental things -- raising awareness, creating impact, and transforming the heart. For awareness, the Internet has been absolutely remarkable. We have trillions of online new friendships; FaceBook releases daily numbers of how people create those friendships across conflicting religions and regions. Today's numbers: India-Pakistan: 199,721, Israel-Palestine: 39,497, Greece-Turkey: 7,988 More than half of the world’s population is now on a social networks, and it's increasing everyday; more iPhones are being produced everyday than the number of people being born. If FaceBook were a country, it would be the third largest in the world. And this whole online world is filled with generative altruism. An hour of video is uploaded every second -- and collectively, we are generating more content in 5 years than we did from the beginning of time to 2003. Over 68 million users share and like content everyday. If Wikipedia were a book, it would be 2.25 million pages long; all for free, with more than 100 million volunteer hours donated on Wikipedia alone. All of this makes for an incredible platform for spreading ideas and content, with very little overhead. For social impact, the use of the Internet has been mixed. We don't need to go further than the Arab Spring to see its remarkable potential. However, it has also created many new problems, ranging from cyber-bullying to "slacktivism" to reducing our attention spans. The jury is still out on where the balance will ultimately calibrate itself, but thus far, it seems to tip in the direction of net positive social impact. Yesterday was February 14th, and I was reminded of a Valentine’s Day campaign in India, back in 2009 -- Pink Chaddi Campaign. In a small town in South India, a group of conservative community members decided to physically assault women who went to bars. A pretty savage response, by any account. People were infuriated but due to the corruption in the political sphere, nothing was being done. So a bunch of sympathizers from around the world decided to get active. They started a FaceBook group and requested everyone to send "pink underwear" to government officials. It spread like wildfire. That small city's government officials started receiving hundreds and hundreds of pink underwear. Not just on Valentine’s Day, but it continued everyday. They really didn't know how to respond. The underwear kept coming and coming. Until finally, they took action and jailed the attackers who were harassing the women. It became a landmark case about the efficacy of grassroots online campaigns, powered by the strength of distributed connections. The Internet, then, is great for spreading awareness and it can be quite powerful in terms of its impact as well. Where it lacks, though, is the third element -- transformation. Online friendships can only go so far. There are 75 million more farmers on Farmville than in the real world. Farmville is not farming, just as online ties aren’t equivalent to “real life” friendships. By itself, online friendships are fairly weak. Back in 2008, a NY Times journalist wrote an article about how amazed he was that he had 700 friends; so he threw a party in the hopes that everyone could get to know each other. One person showed up, and that too, by accident. FaceBook's organizing principle is to retain the online attention of its users and monetize it by displaying ads; this is why they are going to IPO for 75 billion dollars. Clearly, online social networks are providing a valuable utility in our world, but they are also systemically limited. By design, FaceBook would rather have you send an online teddy bear to a friend than to go off their network and give a hug. Nothing against online teddy bears, but it can't replace a hug. :) Science tells us that oxytocin is released in our brains when we interact with others in an altruistic way -- it makes us feel good, improves our health, and increases our sense of well being. If mirroring such experiences online dilutes the inner transformation, what kind of questions do we need to be asking? 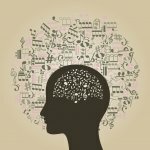 What if the optimal solution is a hybrid that couples the Internet’s global connectivity with the oxytocin of a local friendship? Dot-coms won’t be asking that question since they are only incentivized towards online progress; traditional organizations typically aren’t in position to explore that inquiry since they’re not on the cutting edge of technological evolution. Who will ask those questions? We don’t know yet, but we need to be asking them. If we consider the profound revolutionaries of our time, from Gandhi, Martin Luther King Jr. and Cesar Chavez to Mother Teresa, Dalai Lama, and Aung San Suu Kyi -- the hallmark of their leadership wasn't just their awareness or the impact of their campaigns. Many other strategists might have done better; their strength was in their own inner transformation, which empowered them to touch the hearts of their communities. It's valuable to watch a video on how cigarettes can harm your body; that's awareness. It's valuable to enroll in a program that gives you nicotine patches to get off smoking; that's impact. What transformation does is shift the pattern of addiction altogether; changing the habits of your heart was the true genius of these social change giants. Basketball players will often score a basket, get fouled and yell "And one!" if they get a chance to score that third point. This is the third point. Activism -- and one! If we are to have sustainable revolutions that last for generations, our modern day technologies have to be designed for this element of inner transformation. Each of those legendary service heroes started with changing themselves at the root level, and despite leading vast revolutions, always kept that front and center. Similarly, when we engage at the cusp of our own evolution, we can't help but broaden from self orientation to other orientation. We then serve from a place of abundance, which means we serve with joy and gratitude. We honor our profound interconnection and, as we align with a natural unfolding that is greater than us, we continue to transform ourselves. External change that comes from this kind of positive feedback loop is fundamentally different. When organized, such inner-transformation driven designs work at the intersection of three big circles: outer change, systemic change and personal change. Activism is often defined at the intersection of outer change and systemic change, but it is incomplete without the element of our own internal transformation. Its such a critical idea, but yet we don't have a word for it. So we made up our own word. 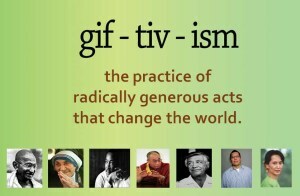 Giftivism: the practice of radically generous acts that change the world. It works by transforming the heart of the change maker, even more than the impact on its external beneficiaries. A key metric of giftivism is that it works to uplift the 100%. It has no enemies. It is unconditionally kind to everyone. Gandhi used to call it Sarvodaya -- welfare of all. It isn’t a new idea, it isn’t copyrighted nor will it ever IPO. “It's as old as the hills,” Gandhi used to say. When Gandhi was about 70 years old, he was giving a talk to several thousand people in the small city of Rajkot. 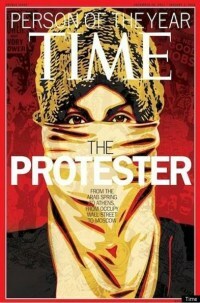 In between the talk, a gang of 600 "bandits" disrupted the gathering to wage a violent attack on the listeners. People didn't know what to do. On one hand, they were listening to an apostle of nonviolence and on the other hand there were these bandits who wanted to dominate through violence. Chaos ensued everywhere. People were seriously hurt; ambulance and police sirens were ringing loudly. In the middle of all this, Gandhi was still up on stage; he closed his eyes and started praying and meditating; his face was completely serene but his body was convulsing, potentially from the negativity of the scene. When he opened his eyes, he informed the organizers that he wanted to speak to the leader of the bandits. Confusion arose since many were afraid to expose Gandhi to the violence; but Gandhi not only insisted, but chose to meet with him by himself. The organizers panicked as Gandhi proceeded to meet the gang leader. 26-year-old Bal Kalelkar was witness to this exchange and later wrote: "To everyone's amazement the thugs' violence melted like ice. The leader of the gang stood before Gandhi-ji with folded hands ... That evening he walked all the way home with one hand on the shoulder of the leader of the gang." That's the power of inner transformation. That's giftvism. Today, social media and Internet technologies are amazing assets for all of us. Gandhi would certainly have embraced them. 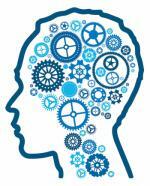 But their designs have to be rooted in the place of our greatest leverage -- inner transformation. We have to ensure that all our technologies continue to report to our collective humanity and not the other way around. This article is based on a talk that Nipun Mehta delivered at the United Nations on Feb 15, 2012. Nipun is the founder of ServiceSpace.org, which works at the intersection of technology, gift-economy and volunteerism.